With our exclusive access to clinical laboratory results from Quest Diagnostics, underwriters now have faster access to specific health information from applicants. If applicant consent* is obtained, underwriters are provided with instant protective value through the historical health database by receiving information that would traditionally be found in the APS. Additionally, by checking the clinical laboratory history of an applicant, underwriters can build a more complete health profile. QuestCheck® provides underwriters access to three years of clinical information – providing laboratory history, physician diagnosis information and physician related information to underwriters. This allows underwriters to do their job faster and more efficiently. Several insurance clients have expressed their interest with QuestCheck during meetings at our Lenexa laboratory. Through a recent QuestCheck pilot, two approaches were studied. The first approach reviewed cases where a policy had not been issued by the insurance carrier. The second approach evaluated those cases where the underwriting decision had been made and a policy was issued. When QuestCheck was ordered as part of the underwriting process, the report revealed conditions not disclosed by the applicant during the telephone interview. Due to the uncovering of these conditions, the insurance carrier rescinded their policies issued to applicants. Below are a few policies that highlight the findings of QuestCheck. Case #1: Applicant answered no to all questions on application for non-medical policy, including the kidney/renal question. Findings: QuestCheck revealed severe Chronic Kidney Disease/IgA nephropathy that pre-dates the application. Case # 2: Applicant answered no to all questions on application for non-medical policy, including the liver disease/hepatitis question. Findings: QuestCheck revealed a positive Hepatitis C test three months before application. Case #3: Applicant answered no to all health questions, including cardiovascular/heart question. During the review of post-issued policies, QuestCheck revealed conditions that were not disclosed during the interview. Had QuestCheck been run during the underwriting review, certain conditions would have been discovered and the insurance carrier would not have issued almost $700K in policy contracts. 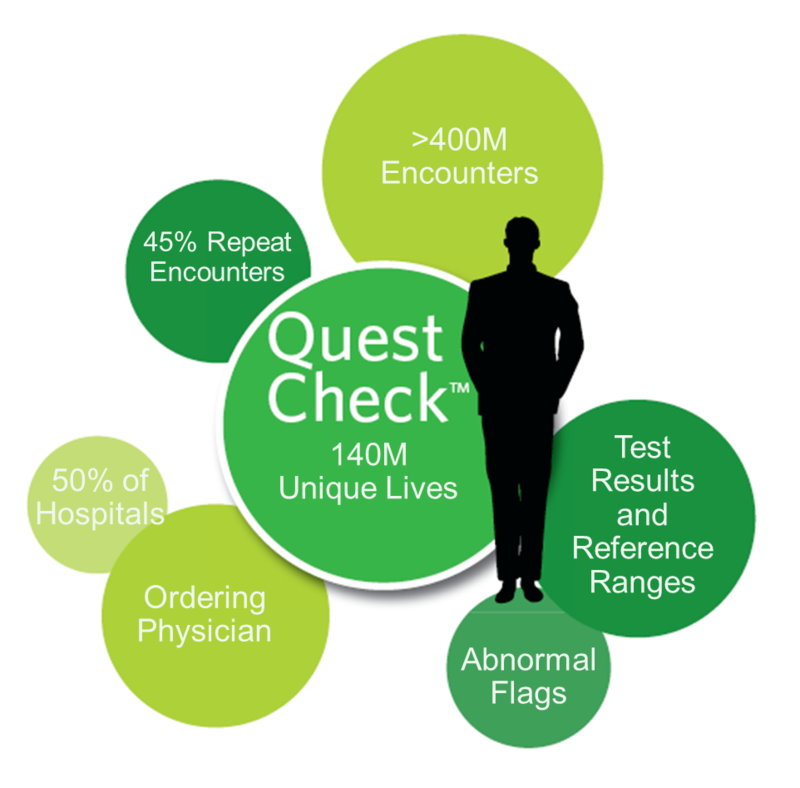 58 year old: QuestCheck revealed tumor markers ordered by oncologist 1 day before application. 49 year old: Quest check revealed positive Hepatitis B testing ordered by an oncologist prior to application. 31 year old: QuestCheck revealed severe renal insufficiency (Serum Creat >9.0) and anemia prior to application date. 65 year old: QuestCheck revealed uncontrolled diabetes, chronic microalbuminuria, and chol/hdl ratios of >9.0 prior to application date. 58 year old: QuestCheck revealed elevated CEA three days before the application. As a leader in the insurance industry, we are committed to helping our clients obtain the best and most accurate data, to aide in precision underwriting. To find out more about QuestCheck or to conduct a pilot on your cases, please contact your Strategic Accounts Executive. *Applicant must provide consent for carrier and ExamOne to run QuestCheck.